Sometimes you try to quit sugar and sometimes you fall face first into a bag of Enjoy Life chocolate chips. Also, sometimes on this same weekend you buy a $10 Mast Brothers chocolate bar. First of all, where the hell do they get off charging that? Secondly, why did they have to make the packaging so damn nice that I actually paid the $10? I hate myself for it. Anyway, what I’m trying to say is that we all trick ourselves into thinking unhealthy things aren’t healthy. But this has almond butter in it guys and almonds are healthy. And with that, I give you this. Also, probably the worst picture ever. But here was the thing, it was dark in my kitchen and I was just not feeling all the hoopla, so this is what you get. Take it or leave it. It’s also SO easy. Just make this and add about 2 tablespoons (this is very exact) of almond butter to the chocolate mixture. okay, yum. that looks delicious! last night, I roasted an asian pear ($3!!!! WHY??) and then topped it with some Enjoy Life chips. I felt so virtuous! I feel like you could market this as “Protein Popcorn” (because of the almond butter) and then when people saw what they were actually getting, they’d be so.stoked. Damn Mast Brothers– I know!! I’ve been on a popcorn kick lately, but I need to jazz it up with flavors. I’m bookmarking this! These are two of my favorite things. I mean really. The sweet and salty? You can NEVER go wrong! 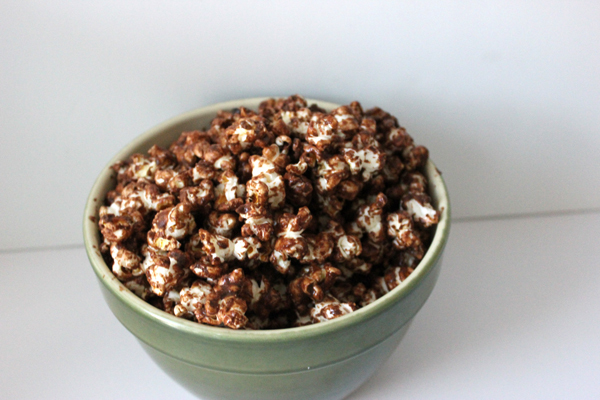 I just blogged about peppermint dark chocolate popcorn today because seriously, you cannot go wrong with chocolate and popcorn. And it IS healthy. Really. I mean it’s popcorn. And chocolate has antioxidants. That’s my story and I’m sticking to it.